Saint John police seized several computers and electronics from Richard Oland's office on July 7, 2011, the day his body was discovered. Walker's supervisor asked him to assist Saint John police in analyzing the items. Trial has heard Dennis Oland left about an hour later. Richard Oland's body was discovered face down in a pool of blood the next morning. Weaver is asking Walker about Richard Oland's iPhone, which the Crown has said was the only item that went missing from the office. Walker says the iPhone was plugged into the victim's computer during the afternoon of July 6, 2011 and a backup was completed at 4:41 p.m.
1st trial took lunch break at this point in the video. Weaver suggests this is a good time for court to break for lunch too. Judge agrees. Back at 1:30 p.m.
Dennis Oland murder trial day # 23 - afternoon session. Court is scheduled to resume watching evidence from the first trial in 2015 recorded on video. Neil Walker, a forensic computer expert called by the crown is on screen. Walker testified that his analysis of Richard Oland’s office computer showed the “ last human known interaction” on it occurred at 5:38 pm the day if the murder. That is close to the time Dennis Oland entered the office to meet his father. The crown believes the murder happens at about 6:30 pm after the meeting concludes, Dennis Oland leaves and drives away but then returns. The defence believes the murder is closer to 8:00 pm. Weaver is asking Walker about his analysis of the backup of Richard Oland's missing iPhone. He used software, BlackLight, to extract data from the computer backup. Because Richard Oland did not communicate with anyone between 6:30 and 8:00 by phone, text or email and did not use his computer after 5:38 the crown suggests that adds to the case of him being dead around 6:30. The defence disputes that. Maybe he was reading mail, or an article or a downloaded document on the computer that did not require key strokes to view. Maybe he went out for a bit. Walker now reading text messages from Richard Oland’s cellphone that was backed up to his computer. A number are familiar, intimate and in some cases suggestive texts from a woman who turns out to be Richard Oland’s long time mistress Diana Sedlacek. 2 pages of an extracted chat log is admitted into evidence. It's text messages between Richard Oland and his mistress Diana Sedlacek on July 5 and July 6, 2011. Walker is reading them aloud. "Had 2 shower … Kisses. Snuggle me up I need your body,” reads one text from Sedlacek to Oland the night before the murder explaining why she had not texted earlier. Less than 20 minutes later, the record accessed by Walker shows Richard Oland replies: "Snuggle up kkk in bed." The texts retrieved from the desk computer end shortly after 4 pm on the day of the murder because Walker says Oland’s iPhone was unplugged from the desk computer at that point. The trial is now viewing Alan Gold’s cross examination of Walker from 2015. Gold asks whether it is possible for R. Oland to have opened a large document on his computer around 5:30 and read through it later without it showing up as a human interaction. Yes, says Walker. Defence lawyer Alan Gold handled cross-examination of Walker. Asks about last computer activity Walker found - launch of Firefox browser at 5:38 p.m. on July 6, 2011. Gold argues no way to know how long the browser remained open - closing it does not create any "artifact"
Walker was reluctant to answer definitively, but agreed he was not aware of any. Gold asking Walker about 3 names Oland gave Sedlacek in his cellphone contact list including Jones, Dr. Jones and Sedlacek. All three names have the same number and have a profile picture of a man instead of Sedlacek herself. Gold introduced additional communications between Richard Oland and his mistress Diana Sedlacek, including one she sent on July 4. "Richard Richard!!!!! It's 2 long now — Hate this waste of time!!!! You're always wasting OUR time OUR life." The records show two brief chats, then Sedlacek started messaging again at 5:56 p.m. She sent 3 texts before Richard Oland responded with a call at 9:10 p.m., according to the records, the court hears. So two days before the date we're all focussed on - two days before police believe Richard Oland was killed - it took him about 4 hours to respond to Diana's first message? asks Gold. Appears so, yes, agrees Walker. Any suggestion that Richard Oland was prompt in responding is not supported by the evidence, correct? asks Gold. Walker says the extracted data "may not reflect the reality." If Richard Oland had deleted individual messages on his iPhone so no one would see them, "to protect himself," they wouldn't be in the backup data, says Walker. Gold points out a message from Oland, "Snuggle up kkk in bed,” was found in the backup. "If you’re going to delete incriminating messages to another woman…" Gold says before Walker finishes the thought - "That would be a good one." Video of Neil Walker's testimony is done. Crown had planned to play video of the testimony of another witness from the 2015 trial today - forensic video expert Grant Fredericks. Not going to get to it today. 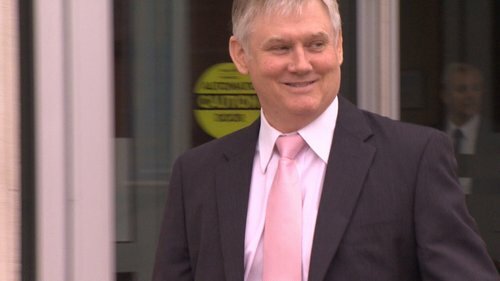 Oland trial was scheduled to sit tomorrow a.m. but Crown&defence still have to work out some details re Fredericks' testimony. In addition, Gold and fellow defence lawyer Michael Lacy both have to be in Ottawa Friday for a Supreme Court of Canada case&bad weather is expected. 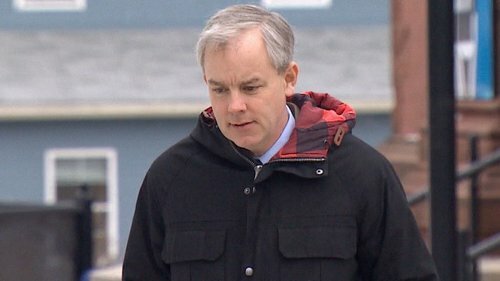 Dennis Oland retrial is adjourned until Tuesday at 9:30 a.m.